Hi guys! We have an extra special Crazy Crafters Blog Hop for you today, showing off all the new products you can get from the upcoming Holiday Catalog. Customers can order from this catalog on 1 September. Need a copy? I have soooo many favourites from this gorgeous new catalog! I usually tend not to mix my suites too much as I like to show that you can make beautiful creations with minimum products. But I took the chance to make a Mash Up card to send out to all my customers with a copy of the Holiday Catalog & show them all the gorgeous little bits in person. I really hope my customers enjoy receiving these packets in the mail! 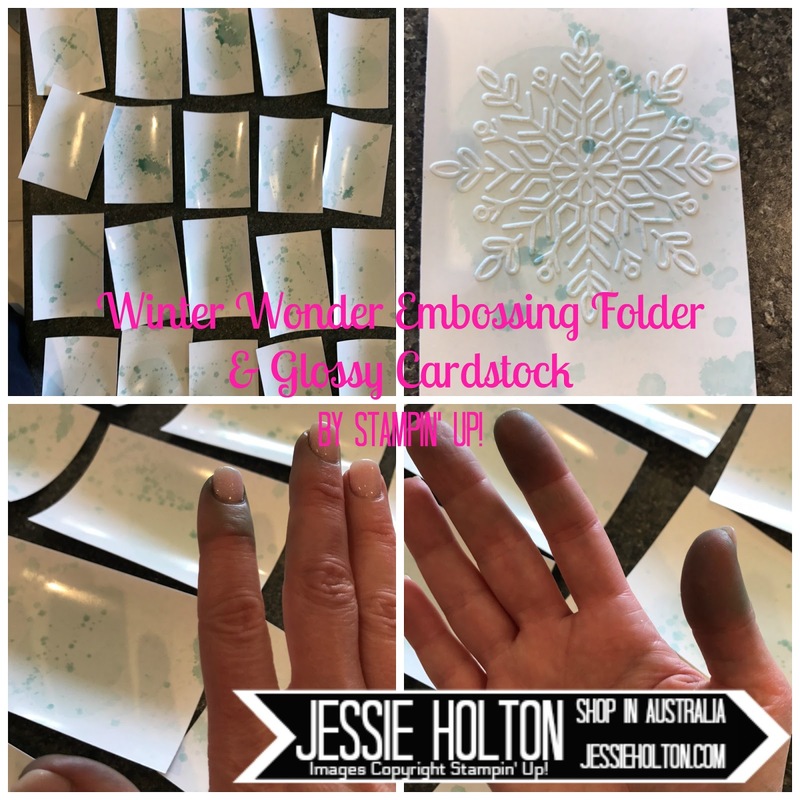 I have used the Winter Wonder Embossing Folder on Glossy Cardstock for the background. I have first mixed Pool Party ink with rubbing alcohol & sponged a little into the middle of each piece, but then I thought it was a bit plain, so I lined up all the pieces on my kitchen bench & splashed them with the remaining ink mix. I was much happier with the splashed backgrounds, but I died my hands blue... again! haha! I really must learn to wear gloves! Black & Pumpkin Pie cats from the Spooky Night Designer Series Paper & cut out with the coordinating Cat Punch! OMG I LOVE THE CAT PUNCH!! Painted Autumn DSP (pumpkin pie & floral) cut out with the Leaf Punch - a must have! The sentiment is from the Painted Autumn stamp set, inked up with Pool Party. I took the opportunity to use the gorgeous Painted Autumn stamp set on the front of the envelopes, too. This stamp set is gorgeous! The colours I've used are Pool Party, Lemon Lime Twist, Peekaboo Peach (for both parts of the two step flower), Daffodil Delight & Soft Suede. I hope you have enjoyed my projects today! I certainly had a LOT of fun making them, blue hands & all haha! Please hop around the rest of the crew & see all of their projects too! It's sure to whet your appetite for this gorgeous new catalog! Remember to use my August Hostess Code HZMADXUN at the bottom of your Shopping Cart & get a handmade card & a gift from me at the end of the month! Please note, you must reside in Australia to order from me.